The median income of American households decreased by as much in the two years after the official end of the Great Recession as it did during the recession itself. The latest estimates from the Census Bureau show that the median income for U.S. households in 2011 was $50,054. In 2009, the year the Great Recession ended, the median income of U.S. households had been $52,195 (in 2011 dollars). 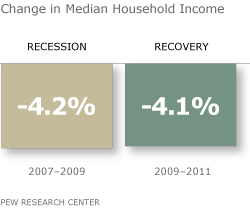 Thus, in the two years since the end of the recession, median household income has fallen by 4.1%. The decrease in household income from 2009 to 2011 almost exactly equaled the decrease in income in the two years of the recession. During the Great Recession, the median U.S. household income (in 2011 dollars) dropped from $54,489 in 2007 to $52,195 in 2009, a loss of 4.2%. By this yardstick, the recovery from the Great Recession is bypassing most of the nation’s households.